I was checking out my email a few days ago and in my inbox was a tune by B elgian duo The Walton Hoax called "Chemical Burn." The duo, friends singer/songwriter Peter Vanek and producer infraBuse, started working on a remix project in 2010. 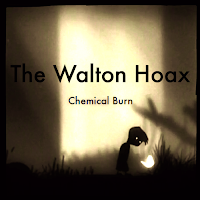 They liked what they were creating and decided to put together a separate project calling it The Walton Hoax. I had a listen and liked it. So, we are sharing it with you my lovely readers. The 3-track EP also titled Chemical Burn will be released in June. But you get to have an advance taste. Go down to the bottom of the post and get it in our MP3 Grab. Also, check out the video for the song below. A few months after the project's birth, they put out a first song: “Chemical Burn”, constructed out of melancholy vocals into brooding, live-wire electronics that take the listener for a sizzling ride into the dark.